Three farms, Church Farm, Babington Farm and Manor Farm, cluster around the church at Dethick. The Manor Farm building contains remains of the old mansion of the Dethicks and Babingtons, so parts of the building are fifteenth century with sixteenth and eighteenth century additions. Manor Farm is Grade 2 listed and one of its outbuildings, as well as a couple belonging to the neighbouring Babington Farm, are also listed. The historian J. C. Cox said there was also an old barn, built by Sir Anthony Babington, still standing in 1915. Thomas Tudor, writing in 1926, added that "the great kitchen is still there, with its turnspit and other curious things of Elizabethan days". In the late 1930s Alison Uttley wrote a fictional novel about the Babingtons called "A Traveller in Time". In her story Manor Farm was called Thackers and the plot was woven around the house and the local area. Manor Farm also featured regularly on the BBC's popular children's programme Blue Peter when Simon Groom was one of the presenters. At the time (circa 1980) the BBC dramatised Alison Uttley's book for a children's serial and the production was filmed at Manor Farm. showing the triple arched hearth range. A photograph, from a postcard, of the hearth range is shown below. The card dates from a similar time to the sketch. of tools are hung above the wooden chest on the right of the same alcove. Behind the range is some sort of recess; lined up along the bottom are a number of flat irons. An oil lamp hangs from the ceiling. So will all those which ere rebellion sought. That King and nobles all may well agree". 1. 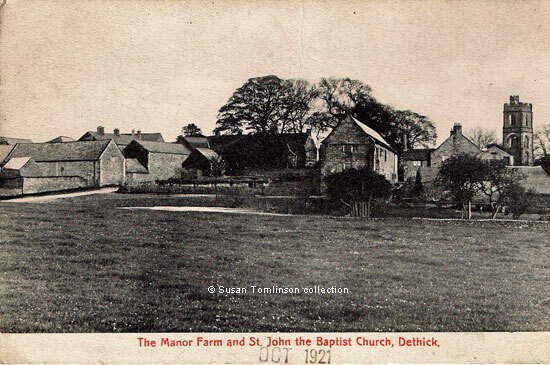 "The Manor Farm and St. John the Baptist Church, Dethick". Published by Scientific Press. Stamped on the front Oct 1921. © Susan Tomlinson collection. 2. 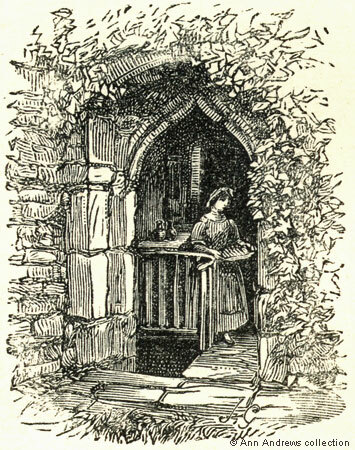 "Cellar Doorway, Dethick Hall", published in The Reliquary, Vol 4 (1863-4). 3. "Kitchen, Babington Manor House", by Thomas Linthwaite Tudor. 4. 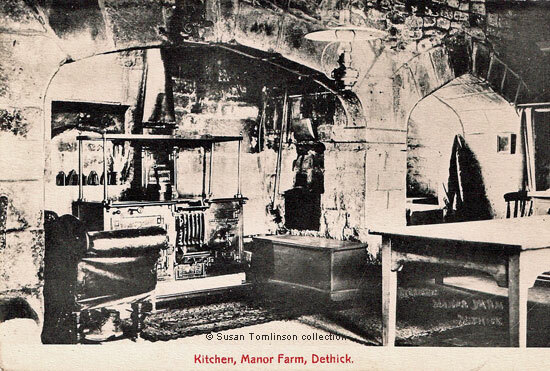 "Kitchen, Manor Farm, Dethick". Published by The Scientific Press Ltd., London. Images 1 and 4 in the collection of, provided by and © Susan Tomlinson. Images 2 and 3 in the collection of, provided by and © Ann Andrews. Tudor, Thomas Linthwaite (1926), "The High Peak to Sherwood, The hills and dales of old Mercia", published London by Robert Scott. With drawings by Fred Adcock and others. Uttley, Alison (1939), "A Traveller in Time", published by Faber and Faber. See a brief biography about Alison Uttley elsewhere on this site. Mrs Uttley had been brought up on a farm not too far away from Dethick. Kelly's Directory of Derbyshire, 1891: Dethick, Lea and Holloway, Derbyshire.